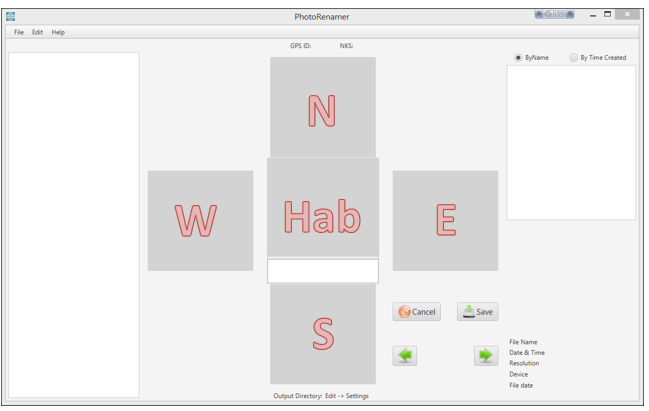 PhotoRenamer is a desktop application we developed in cooperation with our business partners. 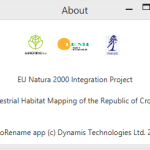 The application was developed in JavaFX for quickly and easily renaming large amounts of photos taken for each point of habitats and is available for Windows and Mac operating systems in 32-bit and 64-bit versions. 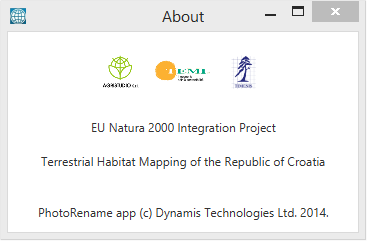 Desired photos are selected and joined to the sites to be automatically renamed so their new name contains the initials of surveyors, the identification number of points to which they belong, and their position in relation to the surveyed habitat (E – East, W – West, N – North, S – South). Choose the desired photo and set its place in the middle of the working window using Drag&Drop method. It is necessary to set the basic parameters, select the input file with a list of the points, and select the required folder to save the renamed photos. Working with the application is very simple: it is necessary to load the Excel file with a list of points and choose a folder on your computer where the images are to be renamed. On the left side of the application interface the point should be selected, and photos on the right side should be adjoined. Photos are placed in designated places using Drag&Drop method. A central photo of the habitat is placed in the middle, a photo that includes the upper part of the habitat is placed in the upper window, a photo which shows the lower part of the habitat is placed in the bottom window. Photos of left and right sides of the habitat (relative from the surveyor’s point of view) are placed in the windows on the left and right. After uploading all photos, select the option Save – photos are then renamed (Note: the names of the “old” photos are not deleted, images are only copied and saved under a new name! ), and the application automatically switches to the next point specified in the Excel file on the left and photo windows are now empty (for the new point). 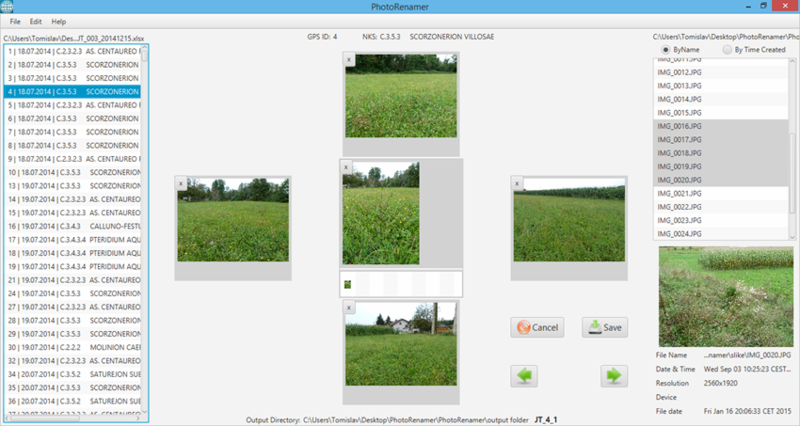 PhotoRenamer can be used as a catalog to view photos assigned to a specific point: if you choose a point with pre-loaded photos from the Excel file within the application, the photographs will automatically appear in the photo windows in the middle of the screen.